What we have here is a statement of a fairly bland consensus position. Right now, when there are substantial unused resources, increased output from the government, whether that means collecting fewer dollars in taxes or going out and buying things, can lead to more growth and lower unemployment. However, there is a long-term cost to a larger budget deficit. So, the optimal policy for short-term output and long-term sustainability is higher deficits now and fiscal restraint later. In theory, this analysis is almost entirely non-ideological. 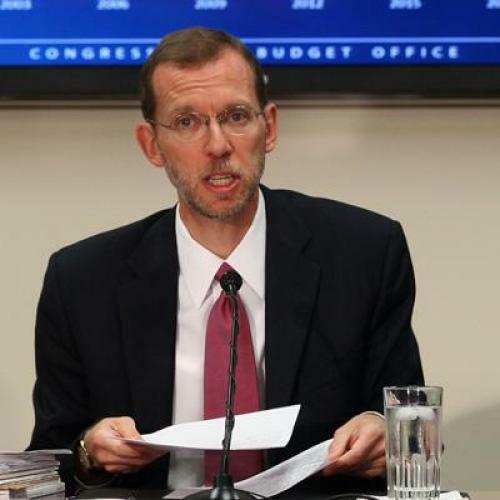 A liberal Democrat could see what Elmendorf has said and advocate for more government spending now, and higher taxes later. A conservative Republican could take this analysis and say that we need lower taxes now and lower spending later. What’s strange, however, is that the political debate does not reflect the economic consensus. What we instead have is a bipartisan agreement on reduced spending in the short- to medium-term, uncertainty about revenues, and Republicans objecting to any form of short-term stimulus while Democrats propose short-term tax cuts in the form of extending the payroll tax holiday. So what we’re seeing is not so much a debate between different ways of dealing with a problem, but a debate where one side doesn’t think there is much point in addressing the current problem at all. The end result is to drag the other side into taking a position that is out-of-sync with its own ideology.